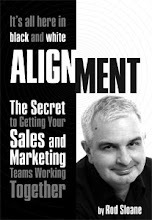 Sales and Marketing Alignment Blog from Rod Sloane: Do you have the bottle to Be Different? “Having the bottle” is street language for having the courage to stand up and do something. Maybe it originates from Dutch courage. I hope that you are reading this totally sober, I maybe have some caffeine in my system, that's all. Why do you need to be different? Because nobody really cares, they don't. Accept that we live in an instant gratification society, look at Twitter. I want it and want it now, Look at me now. As a professional speaker I am probably as guilty as anybody in wanting instant gratification. I want the audience to laugh at my jokes and be hooked on my stories. Yes, I want the applause. I know all about being shallow. Calling me deep is an insult to both of us! Growing up we want to be like everybody else, our mates. Going to work we have to fit in. Now that you run your business or want success in sales you need a different template, Charlie. Be different and you stand out! Be different and you are remembered! Be different and you may just be considered remarkable! Please don't confuse this with all that personal branding tosh. It's not about whether you wear a black or pink shirt. A shirt is just a shirt. Tell me how your ideas are different not your clothing! Go on...Be Different, Not Better!